I've lived in Southern California my whole life - besides four too-short years in Virginia - and sometimes it feels like I'll never leave. And as I sit here writing this in the heart of Beverly Hills, looking out onto palm trees, the Hollywood sign, and more victims of Plastic Surgery Cat Face than most people will ever see in their lives, I think - why would I want to? Answer: because Seattle exists. It's as much an opposite as it is a complement to LA - the weather is nice, but my kind of nice (which involves rain and cloudy skies). Everyone looks good - because in a chilly walking city, a great jacket/scarf/boot combo can make anyone look chic. And the waterfront is just as beautiful and sprawling - but with ferry boats. 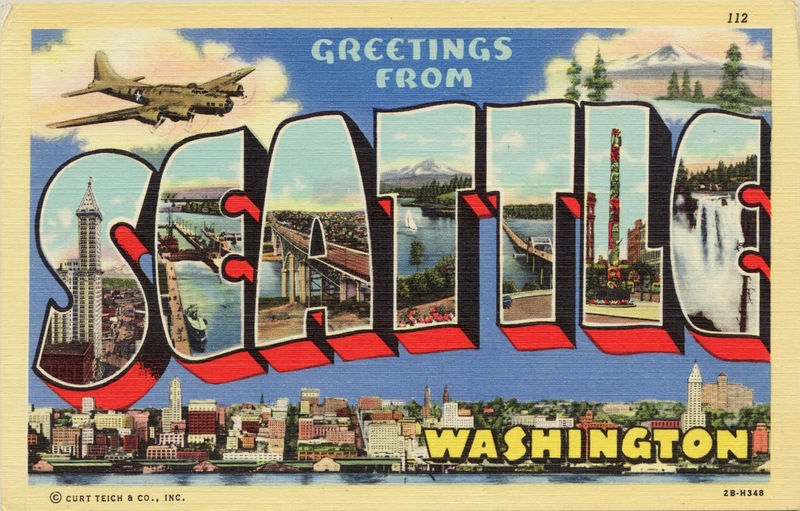 Here's the catch, though: I've never actually been to Seattle. I know, you think I'm nuts for romanticizing a city known for bad weather and melodramatic doctors. But think about it - beer, flannels, rain, birth of grunge, trees, top notch coffee, boats, a spinning restaurant...it all screams MKS. So this spring, Q and I are going on a first date of sorts. A first date with Seattle. 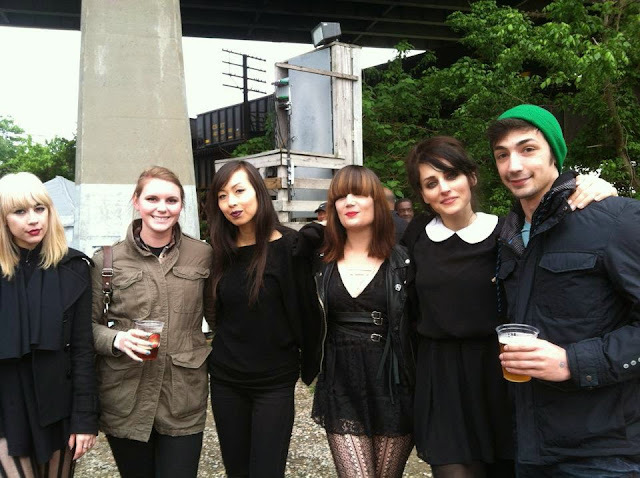 #TBT to Dum Dum Girls opening for De La Soul in Richmond, Q without a mustache, and the only picture of my jacket. Let's talk necessities. 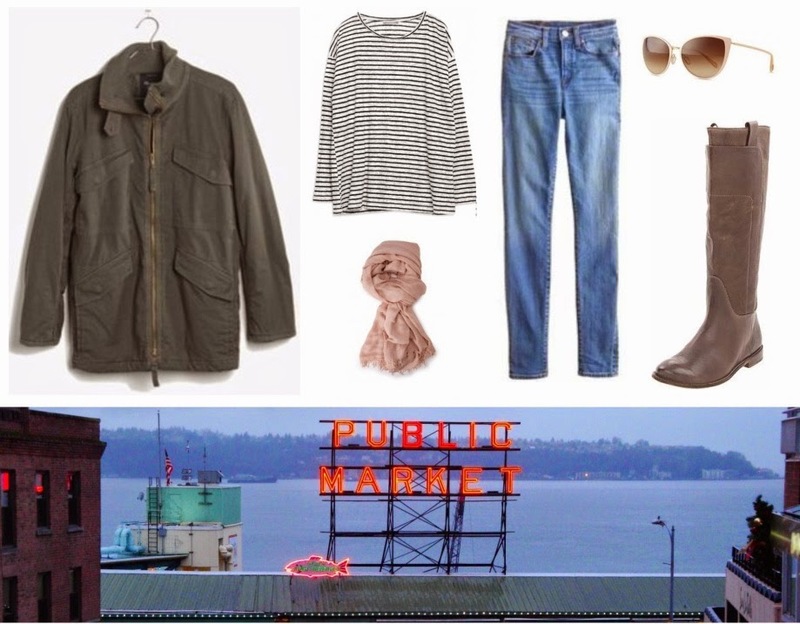 While a weekend in LA would require sunscreen and a car, Seattle is more of a big coat and public transport kind of town. I'll be pulling out my trusty French Connection military jacket from college to top any outfit while the city transitions from a very cold winter to a perfectly breezy spring. Paired with jeans or a dress, this coat helps to dress down my generally uptown looks. 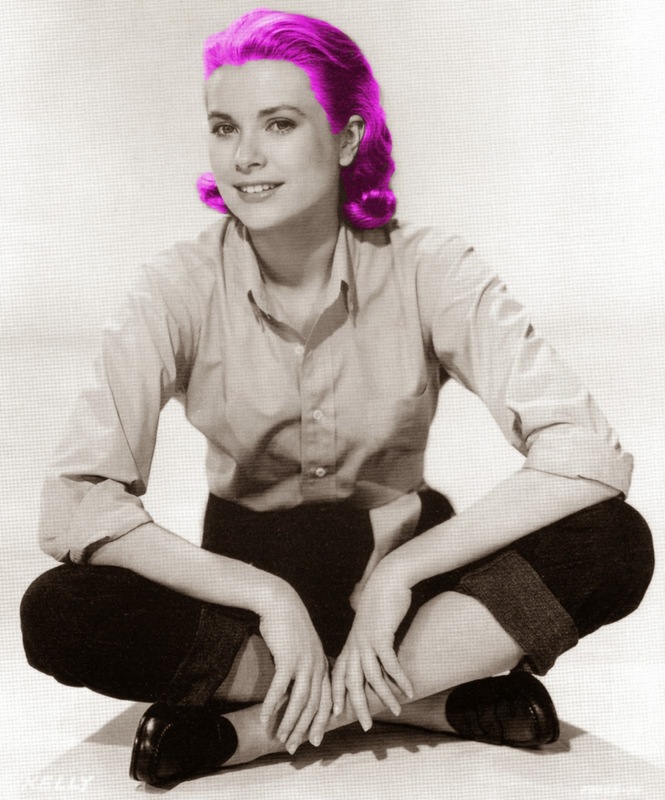 Kind of a grunge Grace Kelly vibe. This trip will also be the maiden voyage of my gorgeous Tumi Vapor carry-on that I am way too obsessed with. Big enough to hold all my outfit options, but small enough to satisfy TSA and avoid any excess baggage fees. This baby is the suitcase of my dreams. 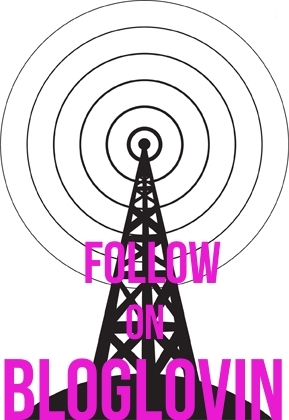 We've got a few activities planned (but still taking suggestions! ), and I find it helpful to lay out all my outfit options beforehand to see where I can re-wear pieces and save space. I see no reason why I can't outfit a weekend with just one jacket, a couple pairs of shoes and a few mix-n-match basics. My overly-specific Google docs are famed throughout the land, but I'll show you the prettier collage version instead. Here it all is - with a few unmentionables not included in this very public platform. I like to layer my heaviest, bulkiest items on the plane so that I can maximize the room in my suitcase, meaning your biggest coat, boots if you're bringing them, blanket scarf, the works. Flats seem like a good idea because they're easy to take on and off, but then you're left with bare feet on a questionable airport floor, which is EW, and flats are very easy to stuff in your bag. I've gotten very swift at removing tall boots in the security line at lightning speed- it's a balancing act for sure. Clothes are pictured nicely folded, but come zip-up hour I'll be rolling those puppies up to save space. Besides makeup and things in boring travel size containers like shampoo, the only real toiletries I need are John Frieda Dream Creme for the flyaways, Murad face wash, and my travel Chance spritzer. You know, essentials. It's a short flight, but a girl's got to be prepared for anything. I never leave home without my agenda and a pen in case I need to get off the grid, headphones of course (stolen from Q), and my fave new toy, my Diana F+. Not every picture has to be insta...they just have to wait til after they're printed to cash in on those likes. Jacket, Madewell. Shirt, Zara (Similar). Scarf, Forever 21. Jeans, J. Crew. Sunglasses, Oliver Peoples. Boots, Frye. Saturday we're going to take our time exploring our Airbnb neighborhood and downtown. We'll probably hit up Pike Place (and the OG Starbucks) before our first timed activity, a visit to the EMP Museum's Star Wars Costume exhibit! When we first started investigating museums in Seattle, this one was a no brainer. It's basically everything we like in one building. You can't go wrong with a striped shirt and blue jeans - I'll probably be buried in this outfit. I'll add a scarf for dimension, but why mess too much with a classic? Dress, Dorothy Perkins. Earrings, Forever 21. Necklace, Forever 21. Flats, Banana Republic. We made a reservation Saturday night for dinner on top of the Space Needle. Yeah, it's touristy and cheesy and overpriced, but we ARE tourists. And if you eat at the restaurant, you can bypass that $20 entrance fee to the observation deck. If you're already planning on going up the Needle, might as well eat while you're at it! After dinner we'll be bar hopping with a fellow former #clubcondé member, so I need a look that is fancy enough for a date-y meal but casual enough for some dive bars. 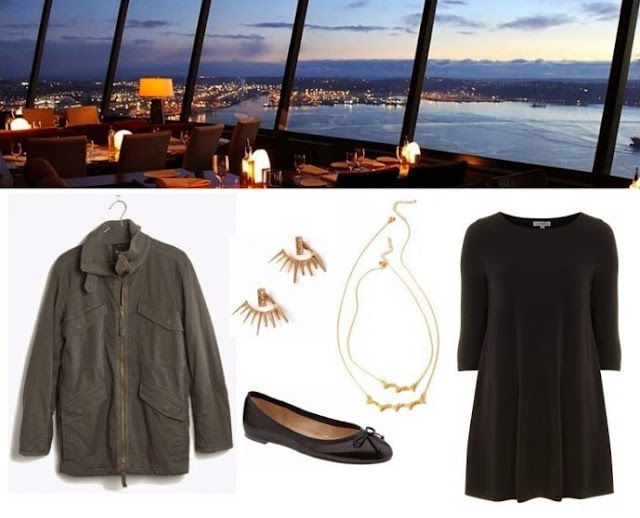 This is where the military jacket's versatility will come in handy - it's warm, and looks fab over a simple black dress. Paired with an easy ballet flat, I can hang wherever and be comfy and chic. Add a lip stain and boom. So fancy. 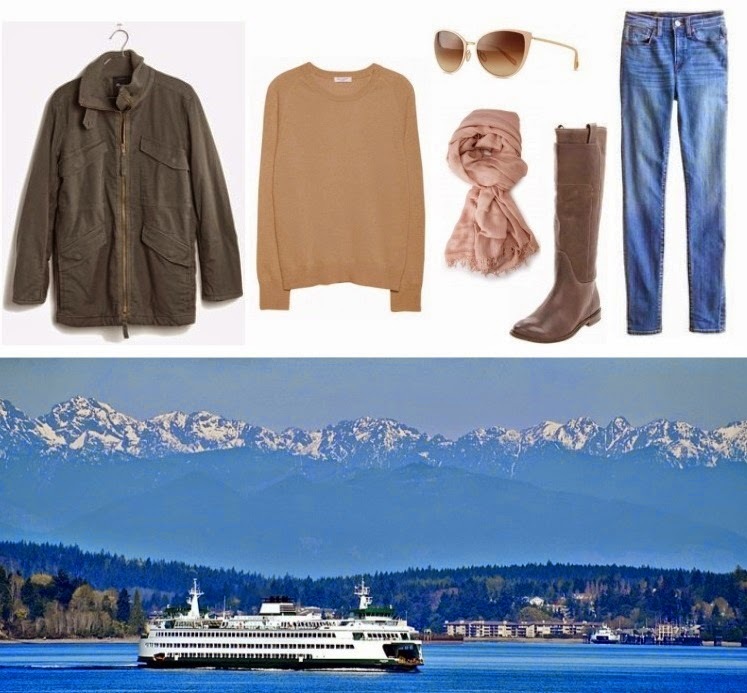 Sunday will feature those dang ferry boats - we're taking a jaunt to Bainbridge Island! There's a cute Main Street area, a couple wineries, and more than enough scenery for a couple of city folk to enjoy. There's no set itinerary (shocking for me), so we're just going to rabble rouse til it's time to head back to the city for our flight. Besides the ride over, I'm most looking forward to having a cup of coffee and a nice, scenic sit-down near the water. I'm a real sucker for a latte with a good view. It's supposed to be a little chilly this weekend (duh) so I'm layering with some lovely cashmere. It's a symphony of neutrals - blue jeans definitely count as a neutral. A little bird told me I'm not the only HI-STYLER traveling this weekend - make sure to check back for a full report on our adventures.